After being a part of the hugely successful sell-out production of West Side Story earlier this year, Holly Evans (who played the lead, Maria) is heading to Asia with the New Zealand Secondary Students’ Choir tour. Holly who is in Year 13, will fly to Auckland next week where the choir will rehearse before flying on to Hong Kong and China. She is Rangi Ruru’s student Head of Culture so the trip ticks a number of boxes for her. “I haven’t been further than Indonesia before so I really have no idea what to expect and am really excited by that,” she says. The New Zealand Secondary Students’ Choir is the national choir for 13 to 18-year olds. It gathers the country’s finest young voices and offers them a once in a lifetime opportunity, a two-year tenure to learn from top New Zealand vocal teachers and consultants. http://www.nzsschoir.com/events/international-tour-july-2018/ Holly successfully auditioned at the end of 2016. Holly says she is most looking forward to connecting, through a mutual love of music, with singers, choirs and choral directors from all over the world. Director of Music at Rangi Ruru, Janet Kingsbury, says Rangi continues to go from strength to strength in all areas of music, illustrated by a number of significant successes this term - a Combo Silver and Best Student Composition at Ara JazzQuest, a finalist in Smokefree Rockquest – Canterbury final being held tonight), winner of Junior Percussion section at the Big Bang Percussion competition, and finalist in the Risingholme Orchestra’s ‘Meaningful Musical Miniatures’ composition competition, results out Sunday 1 July. All in addition of course to West Side Story which kept selling out despite releasing new seats in the lead up to opening night. “In August there will be the Chamber Music Nationals, of which two Rangi groups are among the top 12 from New Zealand, Southern Jam and JazzQuest for the Jazz Band, and we will know if our rock band has made it through to Nationals. There is also the Rangi Ruru Performing Arts Showcase on August 16th, and the Orchestra Festival in September,” she says. Mrs Kingsbury says what is really exceptional about Rangi Ruru is that student interests and abilities are catered for through specifically tailored learning programmes, which accommodate all aspects and genres of music. 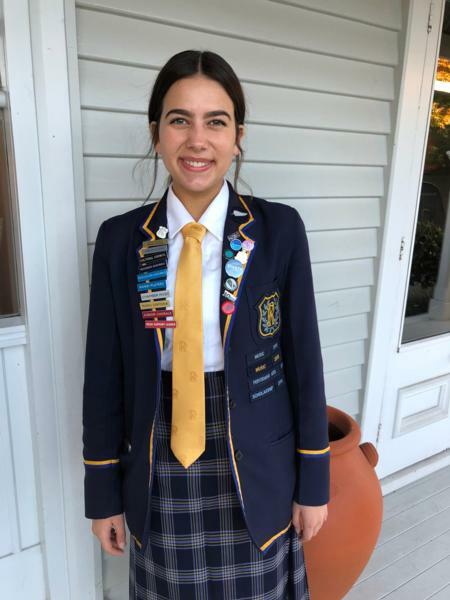 “The academic requirements work in with the co-curricular interests and that enables our girls to do what they do best, supported by the school and teachers,” she says. The choir will gather in Auckland for rehearsals and the Farewell Concert on Saturday July 7. They then travel to Hong Kong to work with the Wah Yan College Kowloon Boys' Choir on a new commission from David Hamilton, supported by the Creative New Zealand Asia/New Zealand Co-commissioning Fund. The Secondary Students’ Choir met the Wah Yan College Choir at the 2016 International Choral Kathaumixw where they won the Choir of the World award while we were Guest Choir. The Hong Kong Baptist University Choir will also join the NZ Secondary Students’ Choir for the international premier of the commission. This is an exceptional opportunity to create amazing music with other outstanding youth choirs. Next the group heads to Shanghai for three more days of musical and cultural adventures, including a performance at NZ Central (the public space for the Consulate General for New Zealand in Shanghai) and working with local choirs including the Vienna Boys Choir Shanghai Choir.